Okay, I have had this error for probably over 6 months and finally after being so lazy to do so am trying to get an answer to fix my problem. 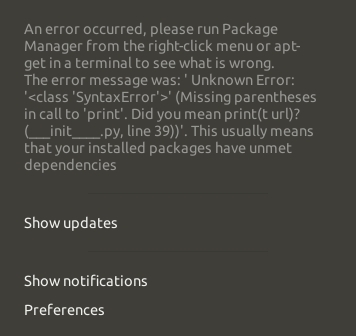 One day, doing absolutely nothing to screw up my Ubuntu, at least not intentionally, I get this error saying I have unmet dependencies and to run apt-get and to run package manager to see what's wrong. The thing is I cannot open terminal from my favorites or from the application menu but only if I right click on the desktop or inside the file manager will terminal open. Plus certain apps such as: gparted, software & updates, software updates and probably some other apps. When I try to sudo update, I get a series of errors and not found. Here is what I get every time I login in and none of the options seems to do anything and just closes the error after I click either option. I think maybe my sources.list is wrong some how because I tampered with it seeing if I wasn't getting the correct repositories. I also tried googling for solutions and non seemed to work and I am at a loss for solutions except reinstall the entire OS but that is out of question considering the amount of files and media I have on it. Browse other questions tagged ubuntu apt repository error-handling or ask your own question.